Below are schematic diagrams illustrating the recommended wall mooring arrangement. This arrangement will enable paired boats to self support should they ground at low water springs. It also details who is responsible for each part of the mooring system. Trot moorings are a similar set-up except that the bow ropes go to a bow riser chain and buoy. Note 1: Reinforced plastic hose should be used to prevent wear at the spliced end of the stern ropes where it is shackled to the riser chain. Alternatively, a nylon thimble could be used. Discuss with Moorings Convenor for advice. Two stern ropes with one slack as a back-up are recommended. Note 2: Each boat owner is responsible for the supply of one chain and fitting to the designated anchor points on the wall. The chain should be either 8mm or 10mm (preferred) and about 18 metres in length. Heavier chain results in boats being pulled towards the wall. Consult with ‘partner’ boat-owner on same buoy. 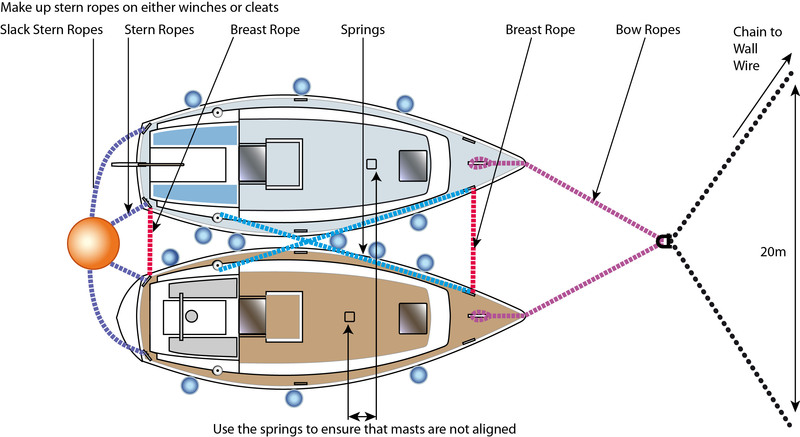 Note 3: Boat pairs to be secured together with springs and bow and stern ‘breast’ ropes to reduce relative movement. 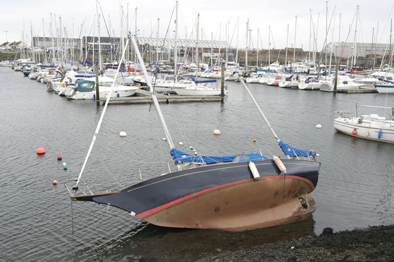 Note 4: Stern rope is best fixed at high tide by lifting riser chain between the two boats and shackling as far down as is consistent with reducing forward movement at low tide but not so low down as to sink boat when abnormal high tides occur. Bow mooring chains and all ropes are to be inspected frequently and changed if necessary. This applies particularly to under-water, tidal section of bow mooring and fixings. Note 5: A sinking pick-up line with float buoy(s) to link stern and bow mooring ropes must be used to minimise risk of propeller fouling. Note 6: Both sides of boat must be adequately protected with fenders. Note 7: Boat owners must liaise with member allocated same Stern Mooring Buoy re fenders and bow mooring arrangement.